Summary: One morning, songwriter Jill Jackson awakened with the words “Let there be peace on earth and let it begin with me” running through her head and a song was born! Set to music by her composer husband, Sy Miller, this song was first sung one summer evening in 1955 by a group of 180 teenagers of different races and religions who had gathered for a workshop high in the California mountains. As the teens locked arms and sang this song of peace, they believed that singing the song with its simple, basic sentiment would help to create a climate for world peace and understanding. Since that time, this song has been sung by groups, and recorded by many great musicians around the world. It has even been used as a theme by the United Nations and by UNICEF. Literary elements at work in the story: The sentiment of the song is a simple one that espouses peace throughout the world that is God’s peace brought about through the promises and vows of individuals to walk and live a life of peace. Through beautiful illustrations that depict people and peace symbols from around the world, this book becomes more than just an illustrated picture book of a song; it becomes a statement of faith in a world that can become the peace-filled world that God intended. How does the perspective on gender/race/culture/economics/ability make a difference to the story? The stunningly creative and vivid artwork of David Diaz brings the words of the song to life in ways that inspire and connect all of God’s creation. From the Biblical images of the lion lying down with the lamb to the contemporary symbols of peace from around the world, this book is a tribute to the song that includes and challenges each individual to sing along. While the lyrics written by Jill Jackson in 1955 are specific to her generation, they have been “modernized” to be more gender-inclusive. Most notably is the alternate wording that is offered for God in the line “With God as our Father, brothers all are we.” By offering the alternate words “With Earth as our Mother, family all are we.” the song is open and inclusive to people of all faiths and traditions. Included in the back of the book is a history of the song and its writers along with a page explaining the various peace symbols from around the world that are used in the illustrations. Also included with this edition is a CD of 12 peace songs written by Jill, Sy, and their daughter, Jan Tache, and recorded by various artists along with the words and music of the original song. The word “peace” in its many variations is used over 429 times in the Bible offering us much to learn about the God of peace and the intentions God has for each of us to live in peace – with God, with ourselves, and with each other. As the Prince of Peace, Jesus came into the world to bring about God’s peace and reconciliation to all of humankind and it is this peace that serves as the inspiration for the opening line of the song written by Jill Jackson. God’s peace has the power to transcend all situations in life that threaten to destroy our spirit and our unity with one another. As part of his final words to his disciples as recorded in John 14:15-31, Jesus said, “Peace I leave with you; my peace I give to you.” These words, accompanied by the promise of the coming of the Holy Spirit, served as both a commission and a challenge for the disciples to go out into the world and share the Good News of the Gospel that would bring restoration and reconciliation – peace – to God’s world. Being peacemakers in the world is not an easy task. It is a daily mindset that permeates each moment and step of our lives giving inspiration to reach out to others with the peace of God. What does the word “peace” mean to you? How have you heard it used? How have you used it yourself? This song suggests that peace on earth needs to begin with a single individual. How can you make a difference in your family, community, and world that brings about God’s peace? What would our world look like if it was full of God’s peace? 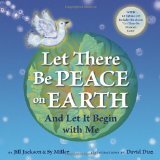 Let There Be Peace on Earth by Storypath is licensed under a Creative Commons Attribution-NonCommercial 4.0 International License.